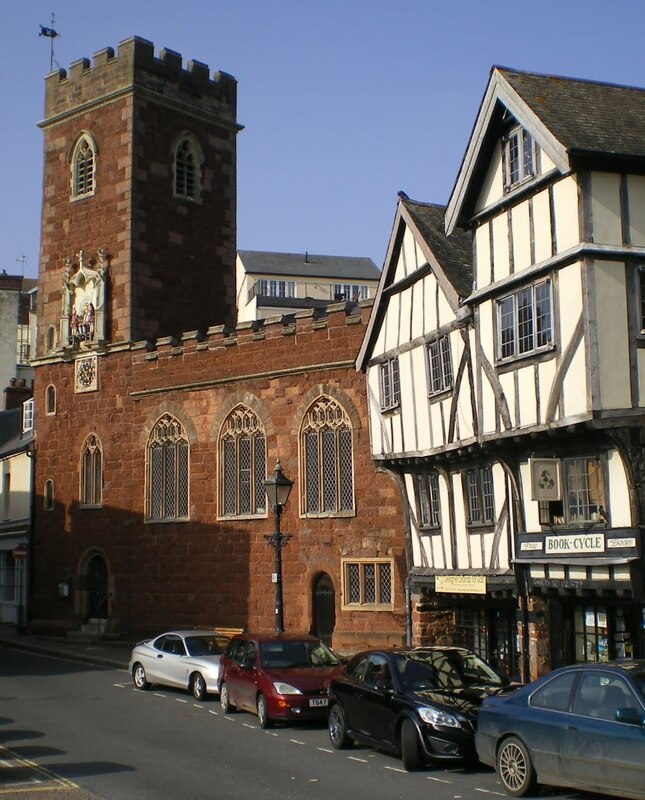 Staying on the theme of the West Quarter, and the Church of St Mary Steps on West Street vies with St Martin's in the Cathedral Close as Exeter's most attractive surviving medieval parish church. Both have extremely picturesque locations, but the medieval charm of the surrounding timber-framed houses, as well as the addition of an unusual clock in the tower, probably gives St Mary Steps the edge despite its close proximity to the city's inner bypass. The photograph left shows the church with Nos 5 & 7 West Street to the right. Two theories have sprung up to explain the name by which the church is known locally. It is dedicated to St Mary but at some point acquired the epithet of St Mary Steps, probably to distinguish it either from the great church of St Mary near the Cathedral or the church of St Mary in Mary Arches Street. Cresswell stated that the name derives from the close proximity of Stepcote Hill, with its sequence of steps either side of what was once an open gutter. Jenkins however thought that the name originated from the fact that the church was built into a steep slope. The floor of the church is therefore elevated above street level and accessed via a flight of steps beyond the entrance door at the base of the tower. There has been a church on the site since at least 1199. Cresswell believed that it was founded before the Conquest of 1066 but the exact date of the foundation is unknown. Nothing of the 12th century church remains, except perhaps the font, as it was rebuilt in the 15th century from the local red Heavitree breccia. The photograph right shows the south wall and tower of St Mary Steps looking up towards the surviving remnant of West Street. The entrance into the church is via the arched doorway under the tower. The small doorway to the right leads into the vaulted undercroft which receives light from the adjacent stone mullioned window. From the 12th century until the 1400s the church probably retained a basic plan consisting solely of a nave and a chancel. The exact chronology of the later additions is uncertain. The south-west tower was probably either added or rebuilt first, followed by the south aisle. In 1462 a wealthy parishioner called Felicia Selman bequeathed money and property to St Mary Steps so that a priest could commemorate the anniversary of her death. Any money left over was to be used on the fabric of the church itself. 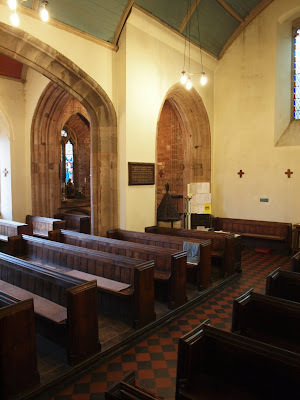 One interesting possibility is that the south-east corner of the south aisle was originally built separately as a chantry chapel dedicated to Felicia Selman. Whatever the truth, the church had attained its current dimensions by 1500. The steep inclination on which the church is located allowed the construction of a vaulted undercroft. This undercroft, accessed now via an arched doorway in the south face of the church, was once used as a lodging for the porter of the long-vanished West Gate. It is believed to have been constructed c1600 but the undercroft only extends under the south-west portion of the south aisle. Is it possible that it was originally a crypt added in the mid-15th century when the church was extended and related in some way to the potential Selman chantry chapel? It's an intriguing idea but remains unproven. In 1805 Jenkins reported that, at least since the 18th century, a stone bench formerly ran along the face of the south wall, "designed for the accommodation of the soldiers". He continued: "[T]his seat being much resorted to by idle and disorderly persons obtained the name of the pennyless bench, and at length becoming a public nuisance it was taken down, about the year 1757". Opposite the east end of the church, on the other side of Stepcote Hill and running along the back of Nos. 5 & 7 West Street, was a very narrow alley called Parson's Lane, at the end of which was "a small ancient house", now demolished, which was where the rector lived. The photograph above left shows the view from the nave looking towards the south-west tower. The base of the tower opens into the church through two arches. Part of one of the wide, very depressed arches dividing the south aisle from the rest of the church can be seen to the left. The interior of the church is full of interesting things. Perhaps most notably there is a 12th century Norman tub font right, one of the finest of its type in Devon. 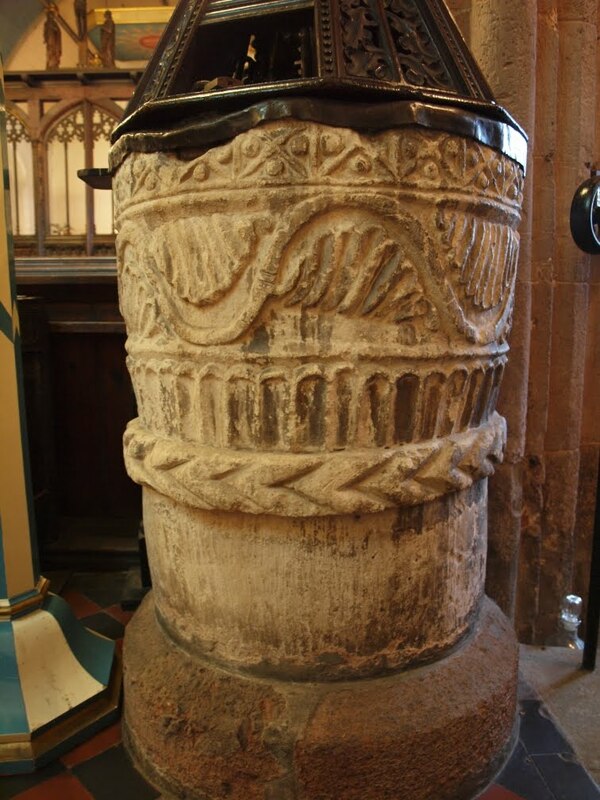 It's cylindrical design makes it unusual in the county where the majority of surviving Norman fonts are cuboid. It's very likely that the font was part of the fittings of the remodelled 12th century church and retained for use in the new structure. It makes the font a contemporary of the two great Norman towers of the Cathedral. The font is decorated with a striking vine and leaf motif which encircles the upper part. Beneath the vine is a sequence of arcading and under that is a band of plaited moulding, all carved out of one giant block of limestone. It's remarkable that the same font has probably been used in the same building for eight hundred years. 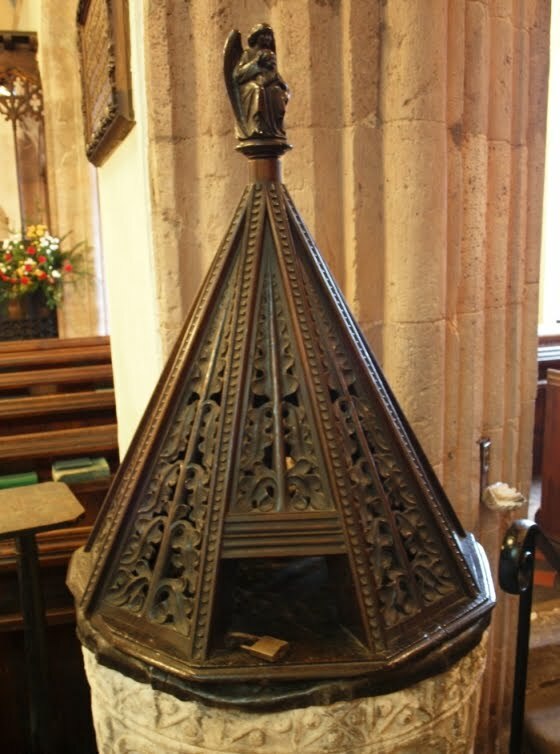 On top of the font is a very beautiful conical wooden cover left. This is often attributed to the prodigiously talented sculptor Harry Hems who worked in Exeter throughout the 19th and early 20th centuries. The little figure of the Virgin and Child which perches on top is probably Hems' work but it's more likely that the cover is Hems's restoration of an existing 17th century piece of woodwork. The crispness of the carved pierced leaf motifs is wonderful. It was well within Hems' ability to execute the carving but there are signs at the base of the cover that it is older than the 19th century. The little hatch in the side enabled the rector to access the water without having to remove the heavy cover itself. The first recorded rector of the church was Alan de Baucumbe, appointed by Bishop Bronescombe in 1273. Along with the font, the most important medieval relic is undoubtedly part of the rood screen that was brought here from the ancient church of St Mary Major when it was demolished in 1865. 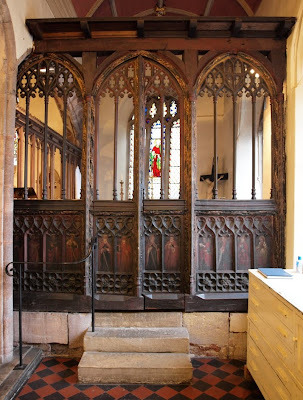 From around 1215 onwards, a rood screen divided the nave and chancel to maintain the sanctity of the Eucharist. The name is derived from the Anglo-Saxon word 'rood' meaning 'cross'. Until they were destroyed in the Reformation, large sculptures of the crucified Christ were often affixed above the rood screens. These sculptures were known as the 'rood', hence the name of the screen which supported them, although in Protestant countries most of these statues were destroyed during the Reformation. A rood loft often ran above the screen where candles could be placed during services or from where a choir could sing. The doorway which led via some stairs to the rood loft can be seen behind the pulpit at St Mary Steps. A surviving document from the church's Wardens' account book shows that the rood was restored in 1557 during the reign of the Catholic Queen Mary. Only three bays of the original screen from St Mary Major were installed at St Mary Steps right. It extends across the south aisle. Dating from the 15th century, the screen is of a high quality with much finely carved tracery. At the base of the screen are 12 surviving painted panels depicting various saints. 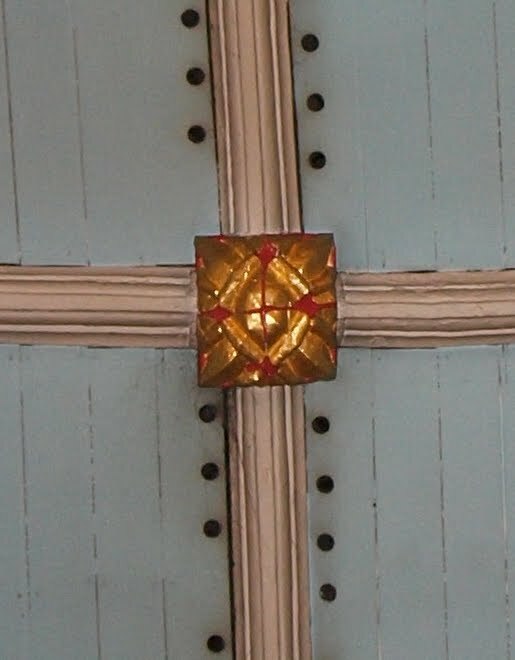 According to Hugh Meller, the rector of St Mary Steps "enlisted an inexpert parishioner to repaint [the panels], thereby destroying much of [their] charm". Cresswell agreed that the panels have been "much over-restored" but enough remains to suggest the vibrancy of the original paintwork. The screen itself poses another mystery. Because the portion from St Mary Major only filled the south aisle, it is widely-believed that the rector commissioned Harry Hems in the 1860s to create a copy of the medieval screen to stretch across the nave. The nave screen is five bays wide and does look very similar to the medieval original. As Bridget Cherry states, "it is quite an accomplished copy". Cresswell goes further: "The copy is wonderful, neither from the carving nor the colouring could one suspect that this piece was quite recent work." The design of the tracery and the style of the carving are almost identical but close examination of the Hems' alleged copy reveals a problem: it doesn't fit. The photograph above shows interior of the church looking east towards the altar. The full extent of the screen can be seen. The three bays to the right, separated from the rest by the arch of the south aisle, are the medieval section brought in from St Mary Major. The other five bays in the nave are Hems's copy. 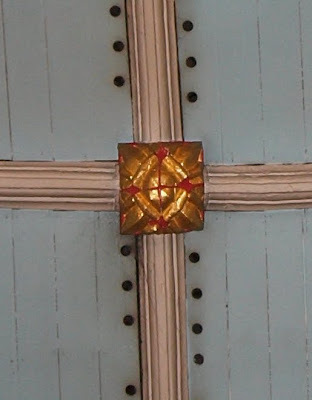 Not only are the five bays of different widths but they don't fit the width of the nave. Examination of the end of the screen which abuts the wall nearest to the pulpit also reveals notches and what appear to be the remains of mortise and tenon joints. If Hems's work really was merely a bespoke copy for a specific location then you would expect it to fit that location exactly. Hems was undoubtedly responsible for the screen but he was also a great collector of ecclesiastical architectural fragments. Perhaps he reworked some medieval timbers into the new screen or adapted an old screen which he reclaimed from elsewhere. 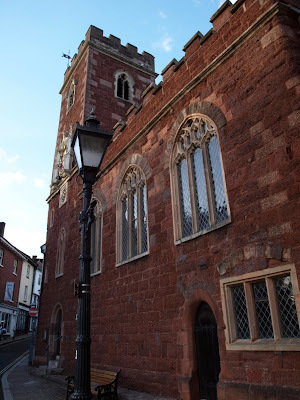 It's a bit of a mystery but either way, the surviving medieval work at St Mary Steps is the only pre-Reformation chancel screen surviving in any parish church in Exeter. Incidentally, the screen once again has its 'rood'. A figure of Christ on the crucifix, carved by Harry Hems in 1907 and recycled when a reredos was dismantled in 1966, can now be seen above the screen. Another fascinating feature of the church are its bells. A narrow spiral staircase leads up through the tower into a small chamber containing the mechanism for the early-17th century clock with automatons which sits high up on the southern face of the bell tower. From here the staircase ascends in almost total darkness to the belfry at the top of the tower. 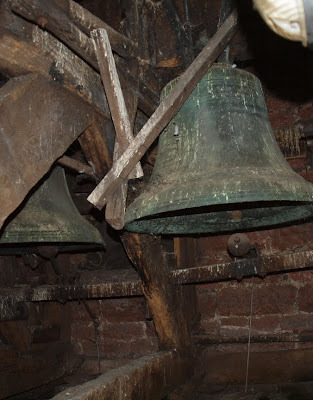 There, hanging in the gloom and affixed to a web of enormous oak beams, are four large bronze bells, all cast by John Pennington in Exeter in 1656 right. The belfry has barely been touched for decades. It is indescribably atmospheric and the four bells have tremendous presence. It's one of the most memorable things I've seen in Exeter.The mouth of each bell must be around 30 inches in diameter. The bells are inscribed as follows i) When I Call Follow Me All I.P 1656 ii) Gloria Soli Deo Detur (Let Glory be Given to God Alone) iii) Richard Meredith John Ball Churchwardens, 1656 and iv) John Pennington of Exon Cast Us Four 1656. It's quite something, to think of the bells hanging here since the time of Cromwell and the Civil War and the changes which have swept across the world in the subsequent 350 years. The bells can still be rung via ropes which descend into the lower chamber (one of these ropes can be seen in the photograph). The ropes move the clapper rather than the bell itself but they can still make a very loud sound. Just two years later, on 14 September 1658 and at the time of the Commonweath, the church was sold for £100 but was bought back by its parishioners after the Restoration of Charles II. In 1865 the Rector of St Mary Steps appealed for funds to restore "the ancient and dilapidated parish church". Plans by the architect Edward Ashworth had already been drawn up but £700 was needed to implement the restoration. The restoration eventually lasted at least until 1872. In 1870 the tower was overhauled with the removal of old plaster from the exterior and new battlements and parapet added. In December 1872 the rector wrote to the city council announcing that "they were about to lower the floor of the church, and in commencing the work they had found human bones". Permission was needed to rebury the remains in the city's Higher Cemetery. The tracery in the south windows was replaced and the 15th century waggon roofs over both the aisle and the nave were restored. Some of the carved medieval bosses left were replaced but others were retained. One depicts the ceremonial sword and cap gifted to the city by Henry VII in 1497. Cresswell found it difficult to decide which ones were genuinely medieval and which ones were Victorian copies but they're all well carved and some are very inventive. The stone pulpit is Victorian replacing the earlier one seen by Jenkins, described by him as a "fine piece of workmanship". It featured a gilt statue of an angel blowing a trumpet and was probably regarded as being too Baroque for a small medieval parish church. 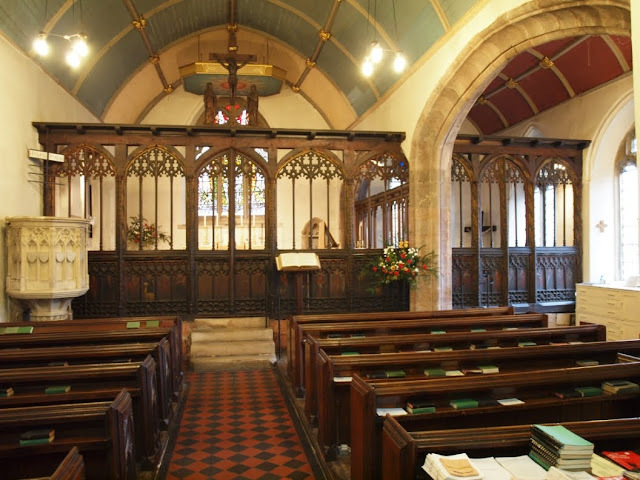 The pews also date from the 19th century restoration. During the rebuilding work a carved bench end was discovered under the floor. 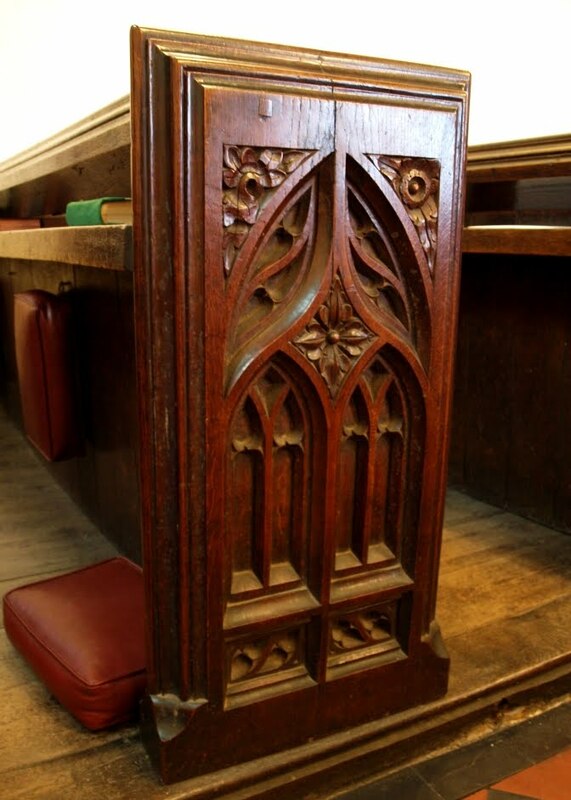 Probably dating to the 15th century, this bench end was used as a template for some of the new pews. Once again, the Victorian craftsmanship is of an impressive quality right, and although the Gothic template remains the same on all of the bench ends each one is characterised by individual details so that no two are exactly the same. The altar was another piece by Harry Hems which was installed in 1888. A further restoration took place in 1966 which is when the glass in the east window was replaced. The red and blue colouring of the roofs was added at the same time. I've not yet mentioned the two oak coffers of c1600 or the lovely little metal strong box which might've once been a poor box and which is decorated with painted flowers and birds. St Mary Steps really is one of Exeter's most rewarding parish churches. 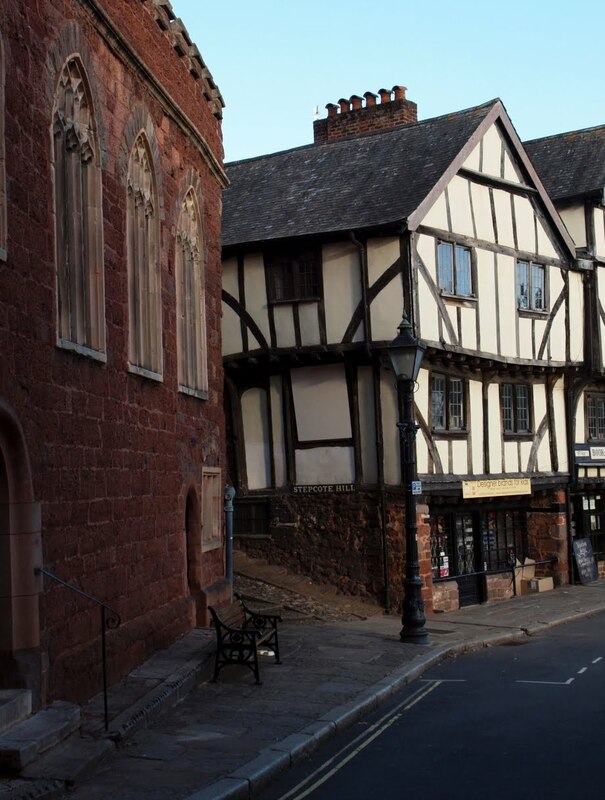 Irrespective of the proximity of the inner bypass this tiny corner of old Exeter, with its handful of medieval buildings, remains one of city's most lovely locations, a remarkably atmospheric survival when so much else has gone. On a Sunday, in the summer and late in the afternoon, when the traffic flows less frenetically, the fabric of the church glows a deep red against the blue sky and with the Cathedral bells tolling in the distance the sense of stillness and timelessness is absolutely magical. They’re unfortunately unringable which is a shame as I I ikagine they’d sound rat her nice!